With much sorrow I am putting up my Patrick Bárta sword for sale. The sword is in the same condition in which I received it, having experienced only dry handling over the past few years and is accompanied (as all of Patrick's swords) by a wood-core scabbard in red leather. 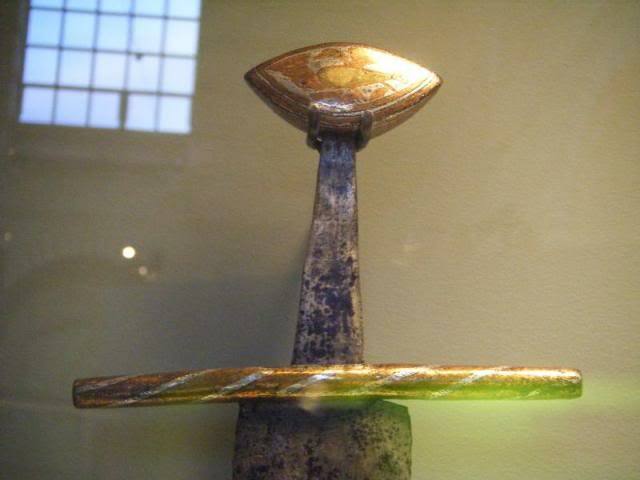 The blade, its inlays and the shape of the pommel were inspired by the Yverdon sword, while the hilt decoration was inspired by two roughly contemporary sources (see below) - the final product is something uniquely Patrick Bárta. It handles beautifully, tracking very well in the thrust and cutting with just the right amount of heft. I am offering it for $1800, please do not hesitate to contact me with any questions. Just a reminder that the sword is still available!